When a hurricane is forming over open, warm ocean waters, the wind pushing the water and the low atmospheric pressure in the eye of the hurricane cause the level of the sea to rise, whipping the water into gigantic waves. Because this is happening away from land, the water can escape and move freely away from the building storm. But as the hurricane moves towards land and the depth of the water becomes more shallow, the ever-increasing wall of water does not have a chance to flow away. Instead it is built up around the eye of the hurricane and forms huge waves. These mountainous waves pound against the land and anything in its path—buildings, homes, piers, and people. Storm surges can be more devastating depending upon the strength of the hurricane's winds and the shallowness of the off-shore waters. A storm surge can also become much more destructive if it occurs during high tide (an increase in water level due to the Moon's gravitational pull on Earth). This is called a storm tide. For example, if a normal high tide for a particular area is three feet and a storm surge occurs at the same time with fifteen-foot waves, a storm tide with eighteen-foot waves is formed. This occurrence makes the storm surge even more devastating. Atmospheric pressure: The pressure exerted by the atmosphere at Earth's surface due to the weight of the air. Hurricane: A severe swirling tropical storm with heavy rains and winds exceeding 74 miles (119 kilometers) per hour. Tide: The periodic variation in the surface level of the oceans, seas, and bays caused by the gravitation attraction of the Moon (and to a lesser extent the Sun). 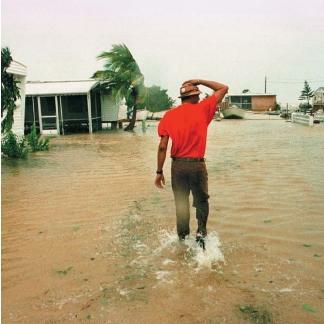 Storm surges have long been recognized as the most destructive part of a hurricane. Causing drownings and property destruction, this incredible wall of water stops for nothing in its path. As it moves across the land, it picks up and carries with it debris that it finds along the way, such as cars, utility poles, and boats. A hurricane hit Galveston, Texas, in 1900 and killed 6,000. The storm surge from the "Great Galveston Hurricane" formed waves that were twenty-five feet high. In 1970, the Bay of Bengal in Bangladesh suffered through a hurricane that produced a storm surge with thirty-foot-high waves that killed approximately 200,000 people. also actually raised the level of the city after devoting ten years to the project. The entire city—every church, home, and business—had 14 million cubic yards (10.7 million cubic meters) of sand poured in underneath it. The combination of building a seawall and raising the level of the city helped increase the odds of Galveston successfully surviving a storm surge. The investment in prevention paid off: On August 16, 1915, a hurricane of almost the same force as the 1900 storm hit the city. While the 1915 hurricane was still tragic—about a dozen people lost their lives—the number of deaths was far below the 6,000 in 1900.